One of the white sharks tagged in South Africa between 2002 and 2003, Nicole makes history crossing the Indian Ocean to Australia. She was tagged with a PAT tagged which popped off in the northern region of Western Australia. Photographs identified her back in South Africa the following season. No SPOT tags required for this ground-breaking data over ten years ago. 2002-2003 - Two white shark traveling from Mossel Bay (sight of tagging) with PAT tags showing migration into Mozambique. New Zealand has its own white sharks! Since 2005, 35 white sharks have been tagged with popup tags, mainly at the Chatham Islands and Stewart Island. These islands support large colonies of fur seals, which are a major food source for white sharks. The results (click righthand map to enlarge) show that most New Zealand white sharks make annual migrations to tropical waters in winter, travelling as far as 3,300 km away. Sharks have migrated to the Great Barrier Reef in Australia, the Coral Sea, New Caledonia, Vanuatu, Norfolk Island and Tonga. They don't cross the equator. About 250 white sharks have been fitted with electronic tags by CSIRO and partner agencies since the research began in 1993. Australia has two genetically distinct populations of white sharks, which don't seem to cross an "invisible boundary" as marked by the red line. As if that wasn't cool enough, it was also discovered that although white sharks from southern Pacific waters also travel to the cafe and Hawaii, the Northern Pacific and Southern Pacific are genetically distinct! 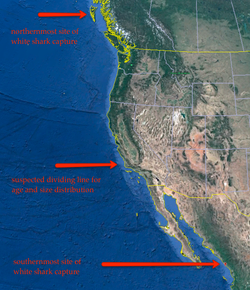 In 1985 Peter Klimley published a paper that deduced where white sharks go along the Pacific West Coast and even determined distribution areas of different ages of white sharks. These conclusions largely match "discoveries" that are being announced today, 30 years later. While the manner by which the data in the studies was gathered is different, their conclusions are very similar. White sharks were caught as far north as Queen Charlotte Island, Alaska and as far south as Mazatlan, Mexico. SeaWorld offered rewards for the capture of live white sharks as far back as 1977 ( two years after the movie JAWS). Large, female white sharks were suspected to move south, into warmer waters to give birth. Juveniles moved north as they grew and could be found in both coastal and open waters. Point Conception seems to be a dividing line. The paper also suspects that different sizes/ages of white sharks occupy separate areas. This paper used data from capture records of the sharks, records of attacks on pinnipeds and otters, aerial surveys, and attacks on humans. No SPOT tagging data was used for this paper's conclusions. Read the paper for yourself. Longline by-catch and incidental recreational catch from 1986 to 1994 off the Western Coast of Florida suggest season presence of white sharks. No tagging data required. Paper suggests the white sharks are present for the increased number of marine mammals during this time (winter and spring). Up to 22% of observed dolphins had shark bite wounds. The earliest recorded white shark off the west coast of Florida was a female caught in 1939 off the coast of Sarasota. White Shark Research in the Mediterranean leaves something to be desired, but the general consensus is that the number have and remain dramatically decreased. However, these maps provide confirmed sightings. The origins of these sharks is theorized to be from Australian waters 450,000 years ago. The Sicilian channel, near the Italian island of Lampedusa, is the only location in the Atlantic region where both pregnant females and newly born great whites have been sighted. 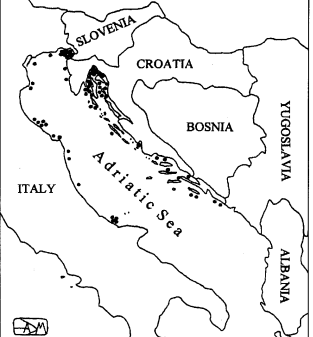 Australian sharks in the Mediterranean? Genetic sampling suggests the white shark population of the Mediterranean originates from Australia and got there accidentally by being caught in a current! Here's the first paper written on the matter. 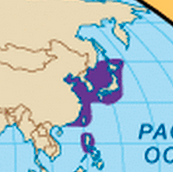 Japan has it's own white sharks!? According to this paper, yes. 1971 - A male white shark was caught off the coast of Mauritias, in September. 1994 - Female white shark caught off East coast of Madagascar. 1996 - Pregnant white shark caught off south coast of Kenya. 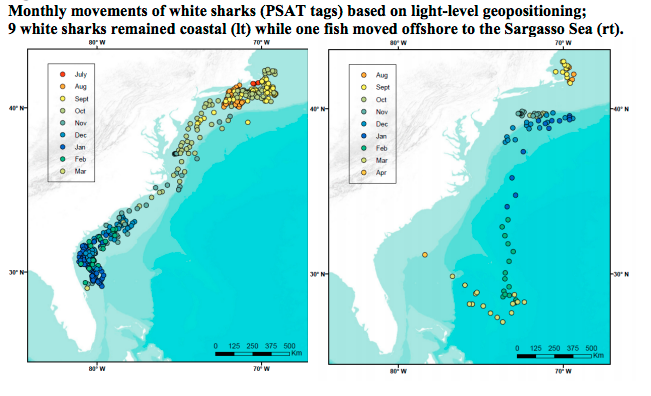 PSAT tags reveal white sharks off the coast of, N.C., Georgia, and Florida as well as within the Gulf of Mexico. Tagged in 2010, published data in 2011. "Of the five PSAT tags, one tag did not report, two tags jettisoned prematurely (one off the coast of Monomoy in September; one off Hatteras, N.C. in October), and two tags reported as programmed. Of those, one shark had made its way to the Gulf of Mexico in January, and the other shark was tracked to an area 200 miles off the coast of Georgia in April. The white shark that migrated to the Gulf of Mexico spent the first two weeks of December in the waters off northern Florida before moving through the Straits of Florida to the Gulf. The tag that popped up off the coast of Georgia was affixed to an 18-foot mature female. This shark's movements did not follow the contour of the Continental Shelf, and tag data indicated the shark dove to depths as great as 2,700 feet every day - in sharp contrast to the behavior of other tagged sharks. Skomal believes this deep diving more closely mimics the behavior exhibited by white sharks off the west coast of North America when they leave coastal feeding grounds." In 2009, the team tagged five sharks in waters off of Chatham - tracking three to the coast of North Florida. Since 1987, the DMF shark research project has been compiling data on white sharks sighted off the New England coast. From the data collected - in particular the tagging results from 2009 and 2010--and other historical sightings, it appears that white sharks are most abundant on the continental shelf between Massachusetts and New Jersey during the summer and off Florida's east coast during the winter. 2009-2012 white sharks were tagged with PSAT tags in Massachusetts. 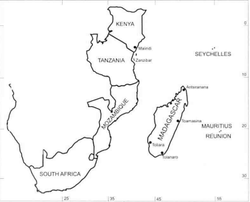 The map on the far left shows the movements of 9 of the sharks while the map on the right shows the tenth shark, which behaved somewhat differently than the others. Massachusetts Fisheries successfully tagged 34 white sharks. With OCEARCH's assistance they tagged only 2.